The collection was donated to the Laurier Centre for Military Strategic and Disarmament Studies (LCMSDS) in the early 2000’s, where it has been since that time. Only recently has it been catalogued and sorted by volunteers at LCMSDS. The No Price Too High Collection is a body of documents and items brought together during the production of the television mini-series of the same name. This series was produced in response to the 1992 CBC mini-series The Valour and the Horror. 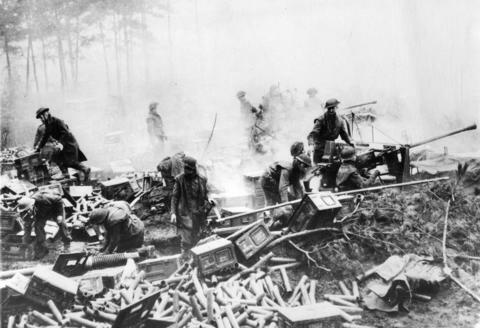 Many veterans and members of the historical community felt that the CBC’s series presented an unfair depiction of Canada’s contribution to the Second World War, with its dubious treatment of documentary evidence, and lack of understanding as to what some veterans may have actually experienced. The response was a mini-series produced using primary documents of various sorts, donated to the production crew by veterans or family members of veterans in the hopes of their story being used to present a more positive depiction of Canada in the Second World War. This collection contains material relating to the experiences of Canadian veterans and their families during the Second World War. Other materials besides textual records include audio cassettes, video cassettes, original and copied photographs, newspaper clippings, photocopied newspaper clippings, and physical objects such as a soldiers ‘dog tags’ (personal identification tag).